Customer service and support is changing rapidly as consumers engage with brands via more channels than ever before. With chat and instant message being such a huge part of people’s personal lives, it’s no surprise that this channel is becoming a preferred way to communicate with companies as well. As such, the landscape of customer support tools is evolving to meet consumer expectations. 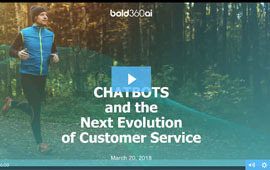 Chatbots have quickly become an integral component of the customer engagement experience, as they enable companies to efficiently manage the larger volume of digital engagements coming their way. However, when implemented incorrectly, chatbots can lead to customer frustration. Learn how to avoid common chatbot mistakes and choose a solution that helps you, your customers, and your support agents.